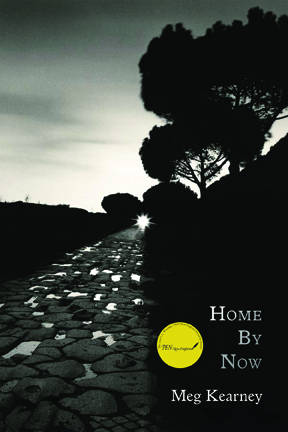 The Speakers of Home By Now, Meg Kearney’s gritty second collection of poems, travel the shadows and edges of modern life, “seducing” would-be parents at the orphanage, waiting for news from surgeons performing a heart bypass, tending bar and their own alcoholism in the tinged days of Code Orange. “Who needs TV drama? This / is life in the volcano. This is as cold as it gets,” asks one speaker, remembering first blow-jobs and two-day benders in high school. With one foot in the rural and another in the urban, this collection settles in neither: “I don’t romanticize / country life, am no longer the kind /of poet to put words in the beaks / of birds,” Kearney writes, describing a hawk flown against a window in terms that “don’t // speak of suicide flights / into buildings.” Her sudden linebreaks generate suspense and impetus, carving gripping poems you can’t look away from for an instant, no matter how distressing or inevitable their ending offers to be. The characters we hear from and watch are searching for homes—in bars and cities, in the country, elsewhere; the tough wisdom they learn through abandonments is that home, once found, can dissolve without warning. In the “The Prodigal Father” the speaker “can’t go back, can’t gas up the old Ford / Fairlane”; another character, reflecting on his Scottish roots, ponders how “love, like hunger, // is a covetous ache for a feast just / out of reach.” None of these speakers emerge unscathed from abandonment, the way their world has collapsed about them: the amputee looking outside on September 12, 2001, “insists / her legs are still / down there // She feels them / burning.” Self-destruction jostles with the loss of loved ones and the unraveling of dreams: “She knew herself well enough to say / no to a place that shared a parking lot / with a bar. She knew, scribbling the deposit / check.” These unflinching poems remind us we are telling stories about our past, present, and future, and that we often end up living those fictions.